Its been raining cat and Dog here in California for almost a week now and the weather is quite wet and a bit cold plus I’ve got a bit of cold. This is the season where everyone in the house craves for something hot, earthy and filling to warm up on the inside. Potatoes appeals to most of us it’s versatile, nutritious, inexpensive and unfailingly delicious when cooked right! The ingredients in this recipe may be simple but together, they make a truly awesome dish. Pair this with your favorite Flatbread, freshly baked dinner rolls or a loaf of french bread for a hearty meal that the whole family will love. I made this potato recipe very similar to this recipe here where I used ground beef instead of cubed beef and it’s so good. I am intentional about mentioning my ground beef variation so that nothing will stop you from making this exotic dish if all you have is ground beef. 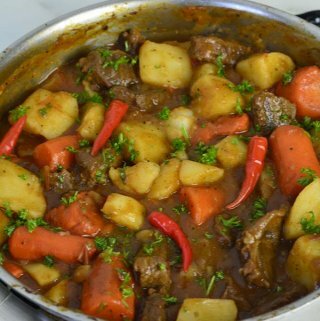 The first thing to do is to prepare all your ingredients, Cube the beef, peel and cube the potatoes, clean and cut the carrots. This makes the cooking process a breeze. Talking about cubing the Meat, it is advisable to cut the beef into bite size. I mean really tiny bite size. This is the secret to getting super tender meat in one hour. If you bought the already cut cube beef from the store, I will advise you still cut them into smaller chunks, in that way the meat will cook faster. 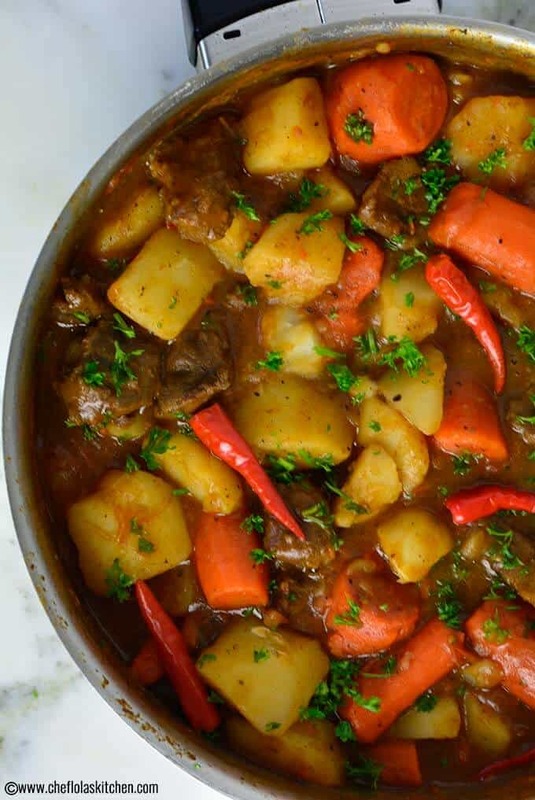 Browning the beef is a key to making an excellent beef stew. Start by generously seasoning your beef. Then, heat up the Oil in the pan on a medium to high heat. Add the beef inside the heated pan, you should hear it sizzle. Leave it to brown on both sides for about 10 minutes. Whenever I’m working with recipes that use of beef and stock or broth, I always like to use Chicken or vegetable stock in order not to overwhelm the recipe with too much beef taste, that is why I chose to use vegetable stock in this recipe. (Chicken stock will work just as well). If you don’t have any stock at hand, simply use one or two bouillon cubes. 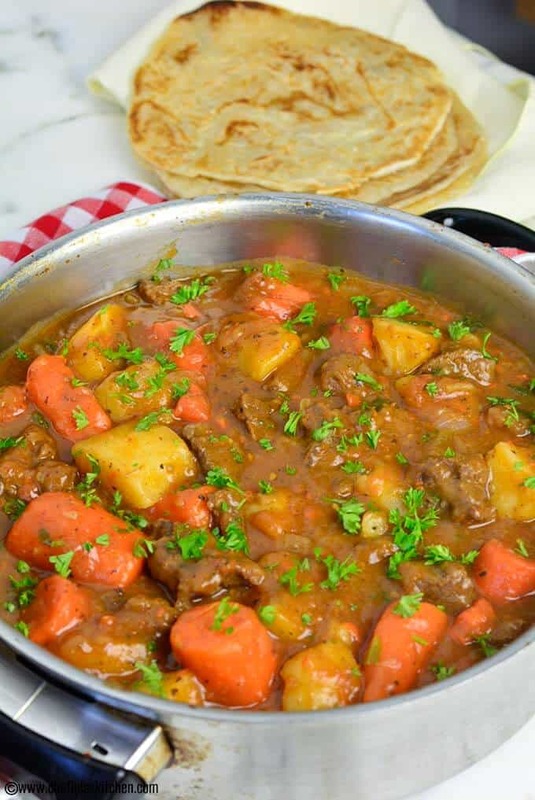 Choose the large carrots so that they can cook at the same time as the potatoes without going mushy. The colder the stew gets, the thicker it becomes. Therefore, you may need to add some water when warming it to thin it out. To make the cornstarch slurry, simply combine two tablespoons of cornstarch with two tablespoons of water. Mix well until cornstarch is well dissolved. 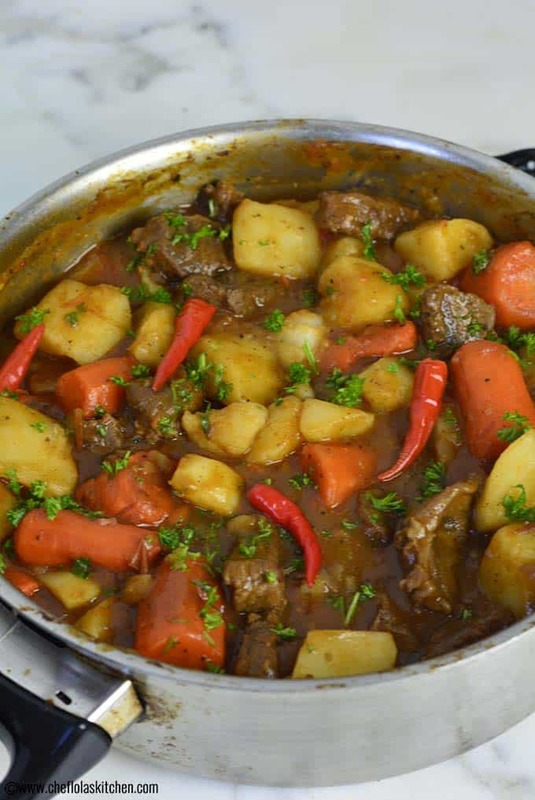 Here is the video on how to make this delicious stewed Potato recipe. 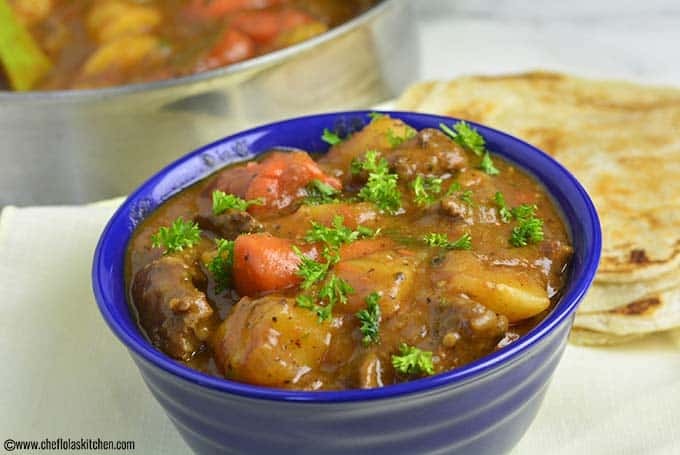 Stewed Beef Potatoes - This delicious and hearty Stewed Beef Potato is refreshing yet hearty comfort food with chunks of beef that are nicely seasoned with salt, black pepper, and paprika. Season the beef with salt, black pepper, and paprika. Preheat the olive oil in a large pan. Once the oil is hot, add the beef then brown the meat all over. Throw in the diced Onions, bay leaves, and chili peppers; cook until the onion is tender and translucent. Stir in the Tomatoes and Tomato paste and leave to simmer for about 3 minutes, so that the Tomatoes can release some of its juice. Add stock and water and let the beef cook in the juice for about 15 minutes. Add the Potatoes and Carrots. Cover and cook for about 20 minutes or until the potatoes are fork tender. Meanwhile, combine the cornstarch and water and mix until smooth once the potatoes are done and stir in the slurry. Let it simmer for about two more minutes until it thickens and stir in the Parsely. I’ve tried the recipe with the exception of paprika but it was still wonderful. Nice! Thanks for coming back a feedback. This looks terrific — and love the hint of spicy chilies in it. Great dish – thanks. Yes, John. The chilies give the meal a nice kick. Thanks for stopping by.